Do you remember the game "Simon"? A lot of people my age (born in the 70s) got to lose a lot of time playing it. The game was simple, it had 4 buttons of different colors that would light up in sequence and you had to repeat the sequence. Every time, you got it right, the game would give you the sequence again with an additional color at the end. As an "adult", I discovered the joys of Arduino and with that, got the opportunity to revive my long lost time wasting friend. 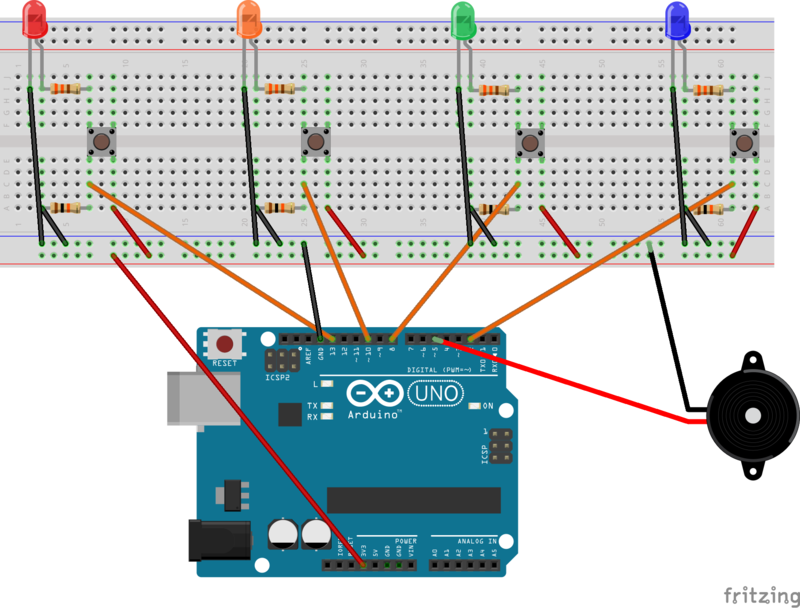 This tutorial will show you how to make a similar game using an Arduino Uno a few LEDs and resistors and a relatively simple circuit. The program itself may be a little complicated for a beginner so I tried to explain in the code what it does and how. The simplest way to get this game running is this. The game starts after about 3 seconds with 5 slow flashes of all the LEDs. All lights are blinking. That's good! If one or more LEDs don't flash, check the wiring. On my board, the very small buttons don't always sit properly and have a tendency of popping themselves out. If the wiring looks right, try inverting a working LED with a non working one to see if it's wiring or the LED itself. The last sequence you were given will play so you can count your points followed by the 5 slow blinks from earlier indicating the game is starting again. You have 2 seconds to press each button. Want to make it a little harder? Why not change the top line in the code to a different value? Put a short delay as the first statement of your setup() function. It's very easy to make the Arduino go into an infinite loop or lock it up in some way. If that happens that short delay allows you reset you Arduino and upload a blank sketch before it locks up again. . If you want to see a really cool idea for a similar (yet way more advanced) game. Check this https://www.instructables.com/id/Lego-Mini-Memory-Game by Peter Kent. He made the game on mobile with an interface to a Lego car. It's really awesome! This is the entire code for the game. Simply copy and paste it in your favorite IDE and upload it to the Arduino. // You could make the game harder by adding an additional LED/button/resistors combination.